Over the last decade we have seen numerous robots being released and paraded as the ‘next revolution in robotics’ none more famous than Honda’s Asimo robot. However, we think that 2015 might actually be the breakthrough year we’ve all been waiting for…and here’s why. Pepper Robot – salesperson, caring companion or just a bit of fun? This year we are looking forward to the European release of Aldebaran robotics Pepper robot, building on their hugely successful NAO robot. You may have already seen it being used by their Japanese parent company, Softbank, and it’s now being integrated into 20 Nestlé appliance stores within the Asian marketplace. Softbank engineers boast that Pepper can complete around 80% of conversations successfully and can also learn from each individual conversation to develop its knowledge and language skills. Nestlé plans to have 1000 Pepper robots active in stores by the end of 2015 and feels that their introduction will lead to a more complete brand engagement experience and whilst providing them with an increased probability for sales conversion. This will be done by syncing the data that Pepper collects in real-time to display areas in-store, at the counter, on a person’s mobile device, and while on commute back home although this could be seen as being a bit invasive and a tad overkill, nobody wants to be hounded after all. Softbank’s CEO, Masayoshi Son highlights, “We hope that providing people the opportunity to interact with a robot whilst shopping, we can help create experiences of wonder and delight for consumers” and according to a survey by The Mirror newspaper 53% of respondents would feel comfortable buying a coffee machine from a robot. Another area which has seen significant growth is collaborative robotics, robots which can interact with humans and don’t need to be housed in safety cages. Rethink Robotics have led the charge in this field with the development of the Baxter Robot which has been integrated into over 700 factories in the USA alone. Such is the markets confidence and the potential of Rethink Robotics, General Electric Ventures and Goldman Sachs, among others, have just invested $26.6M to encourage growth and development in the field of collaborative robotics internationally. Scott Eckert, President and CEO at Rethink Robotics adds, “Our new and existing investors recognize the enormous market potential for smart, collaborative robots in manufacturing, and they share our vision for driving ongoing product innovation, volume deployments and continued expansion into global markets.” We’re keeping an eye out for what new technology Rethink Robotics will be releasing in 2015 but hope to see the past trend of offshoring continue to be reversed through low cost collaborative robotic solutions. Domestic Robots – The Internet of Things or everything being taken over by the internet? Domestic robots have also been widely touted as being the next big development in the field of robotics and at CES 2015 there were lots of products featuring The Internet of Things applications. Samsung CEO, Boo Keun Yoon highlights, “The internet of things has the potential to transform our society, economy and how we live our lives” and as such Samsung has committed $100M to developers to create an open source platform. Samsung has stated that by 2017 90% of their products will be internet connected. Ericsson, the Swedish telecoms multi-national, recently exhibited at the Mobile World Congress using Lego robots, built with Lego Mindstorms to showcase their employees ideas for robotics solutions for the 21st century. Ericsson asked their staff to get creative and develop robotic solutions in concept using Lego to serve the needs of mankind. 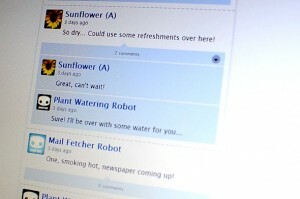 The four robots all ‘talked’ to each other using a Twitter style Social Internet of Things system so that each one could tend to the needs of the other or their environmental surroundings. The plant could message the gardening robot to ask for water and the gardening robot could then message back to say it was on its way and this is the concept being followed by Samsung for domestic household robots. Robotics Research – Practical Application or Practically Useless? Robotics researchers have often complained that there has been a gap between what is theoretically possible and has been tested in a lab on a small scale and to what is feasibly possible in a practical environment. This has mostly been due to there not being a single platform which can be used for R&D as well as for practical implementation. However, since the introduction of the Baxter Research Robot, researchers can now use this platform on which to develop ideas so that they can be implemented with the Baxter Manufacturing Robot! This is due to the unique nature of the Baxter robot range. Both robots are identical in their composition, there is no left and right as it’s all configured through programming, which means that the production process benefits from economies of scale by not having to produce 2 sets of parts for each individual robot. 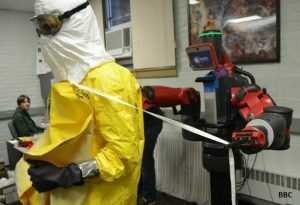 This has led to some intriguing research at some Universities such as the Baxter the space farmer and Baxter the Ebola aid worker projects currently being undertaken. Other uses for Baxter have also been developed, such as stage artist Marco Tempest, who uses Baxter for his illusionist stage show Electric Deceptive Intelligence (EDI). There are also numerous other fascinating research topics in progress and Amazon have even created a $26,000 competition using Baxter. So, the future looks bright for robotics in 2015 and we might even see a hoverboard come in at some point as well….watch this space!